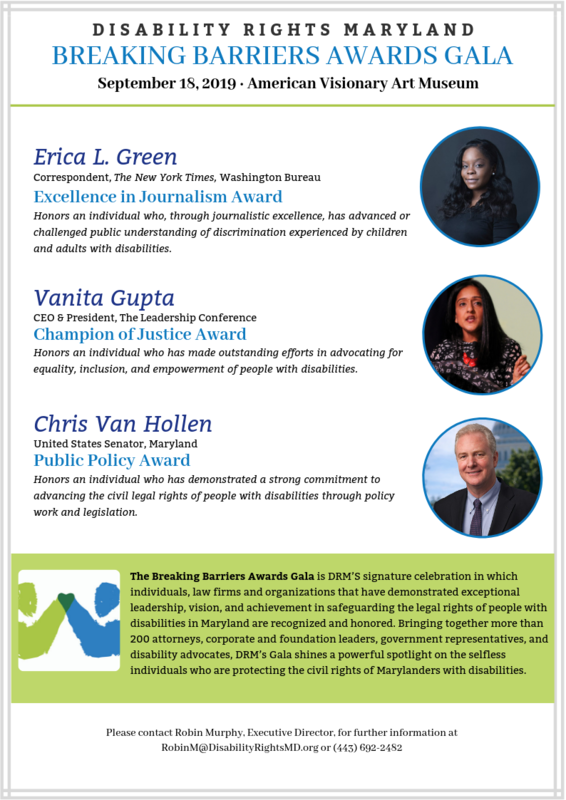 The Breaking Barriers Awards Gala is DRM’s signature celebration where individuals, law firms and organizations that have demonstrated exceptional leadership, vision, and achievement in safeguarding the legal rights of people with disabilities in Maryland are recognized and honored. Bringing together attorneys, corporate and foundation leaders, government representatives and disability advocates, DRM’s gala shines a powerful spotlight on noble individuals who further the rights of Marylanders with disabilities. Funds raised at the Gala will directly support DRM and expand our capacity to provide critical legal assistance so Marylanders with disabilities, regardless of income, age or race, can live full independent lives in the community. We look forward to celebrating with you on September 18th at the American Visionary Art Museum in Baltimore, Maryland! Notifications and updates about the event will be posted to this page.